Located at the Grand Lake Community Center! How Does This Library Work? This Little Free Library offers a way to share good things to read—favorite books from your childhood or books you would recommend to friends; books that teach, intrigue and engage you. All of us can help by keeping this collection stocked with good reading material. Whose library is this? It belongs to everybody — neighbors, friends, and people we don’t even know yet. Anyone can use it. That’s why we want to take care of it. Take a Book. We support reading for children, literacy for adults, and libraries around the world. If you see something you would like to read, take it. Look inside and see who gave it; who else has read it. Share it. 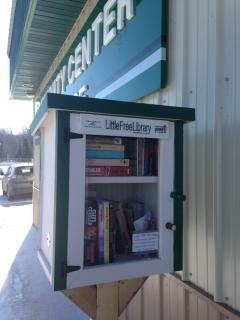 Return it to any Little Library or pass it on to a friend. Give books. Leave notes in them. Be a friend of all libraries by helping any way you can. Pay it Forward!